A period of sunny and dry weather in April resulted in the earlier than planned resumption of fieldwork at the High Pasture Cave site. This allowed us to make a good start to the 2007 fieldwork season, primarily working on the surface trenches. 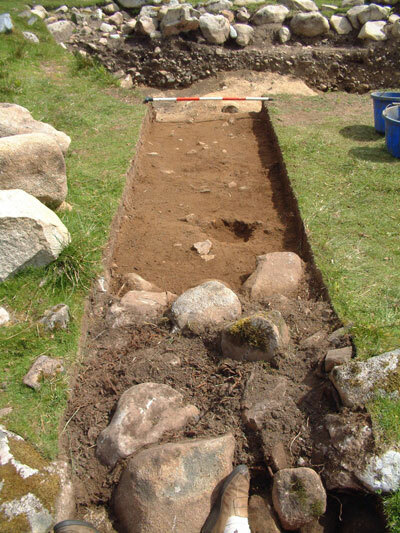 After removal of the winter covers and a clean of open trenches we soon moved on to opening up new areas of excavation, including extensions to existing trenches to investigate partially visible features and anomalies highlighted by the geophysical survey undertaken at the site in 2006. 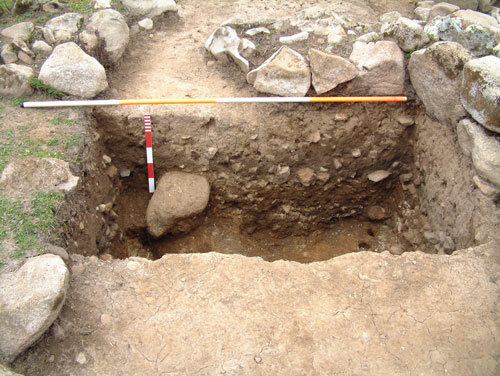 In particular, some of these trenches have been located to investigate further the areas of burnt mound/spreads - deposits of fire-cracked stone and pebbles that comprise much of the remains of activities that have taken place at the site in prehistory. Radiocarbon dates undertaken on charcoal samples recovered from the burnt mound/spreads in 2006 (Trench 9) indicate that these deposits started to form in this area of the site around 750BC, and continued to form until around 100BC. The image above shows Trench 11 from the SW after removal of the burnt spread material to reveal the natural karstic clay - from within the middle of the u-shaped enclosure. The two small post-holes or pit features have been cut into the natural clay, while a low revettment wall can be seen towards the top of the low bank beyond. A fragment of vitrified stone crucible with adhering copper-alloy residues was recovered from the base layer above the natural clay, immediately outside the revettment wall. This view from the SW shows the NE end of Trench 11 with Trench 16 beyond. 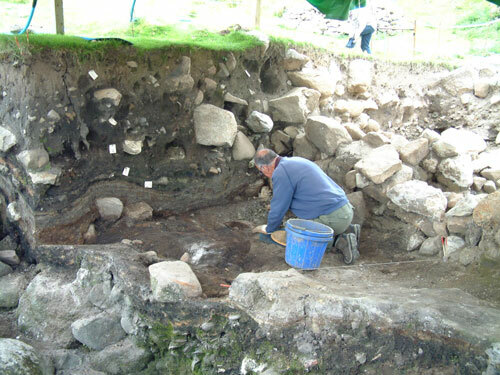 A second revettment wall can be seen uncovered in Trench 11, the core of the wall containing fire-cracked stone and a dark charcoal-rich deposit. Trench 16 was opened to investigate the extent of the burnt mound running to the north of the core of the site and has can be seen from the image, the removal of the turf revealed a compact layer of burnt stone and pebbles. The compact layer of fire-cracked stone in Trench 16 can be seen in this image, viewed from the NE. Trench 11 can be seen beyond (scales-2m & 0.5m). The only finds recovered from this trench so far is a fine flint core (bipolar), from which long and narrow blades have been removed. This view of Trench 16 from the NW, after removal of the fire-cracked stone layers, shows the remains of a possible stone-built structure or area of paving. This feature will have to be investigated further by the extension of the trench. The image above shows Trenches 16 and 11 from the NE, while the 1m square test pit in the foreground shows the natural bedrock - in this case part of a volcanic dyke that runs through the NE sector of the site. This small trench produced an important result, showing that the burnt mound/spread deposits do not extend beyond this point. Elsewhere on site, excavations have resumed in Trench 14. 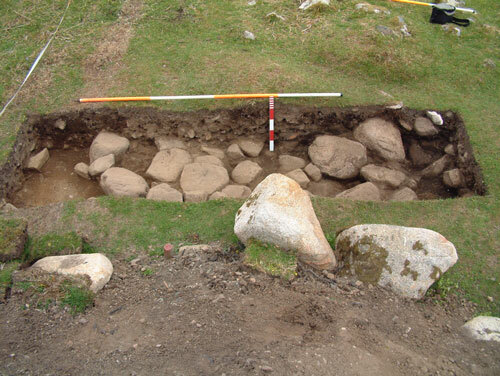 The shieling structure was uncovered in this trench in 2006 and was found to be late in the sequence of deposits uncovered at the site. The discovery of a clay pipe stem complete with manufacturers mark indicated that this structure went of use around 1850AD, dating that was also confirmed to some extent by the stratigraphy in this trench. The structure had been built on a thick deposit of slope-wash material that was sterile and contained no finds. 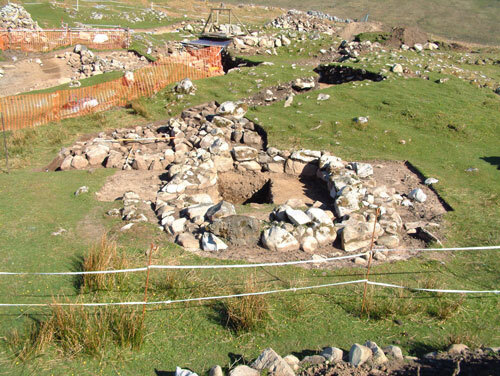 The image above shows the two shieling structures from the S, with shieling structure number 1 closest to the camera. 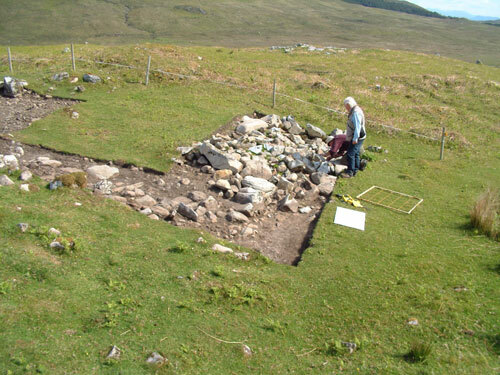 The location of the test trench within the interior of shieling 1 can be clearly seen. 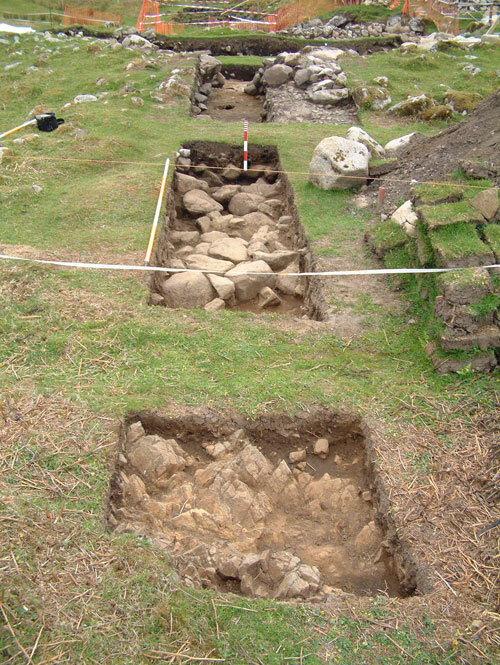 Shieling 2 has recently been cleared of turf and overlying loose stone to reveal the walls and possible paving inside. This view was taken from the S, with shieling 1 immediately to the right. 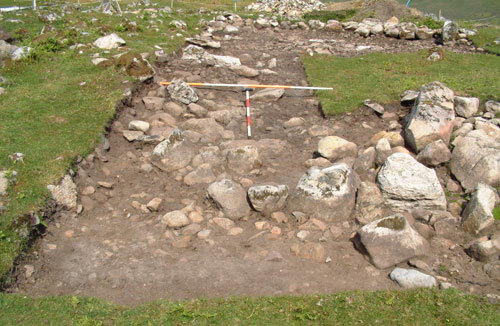 This view of shieling 2 from the NW shows the outline of the structure clearly, which appears to have been built directly on top of the burnt mound/spread material. The structure has now been planned and we can continue to excavate a section through to reveal constructional details and any possible underlying features. 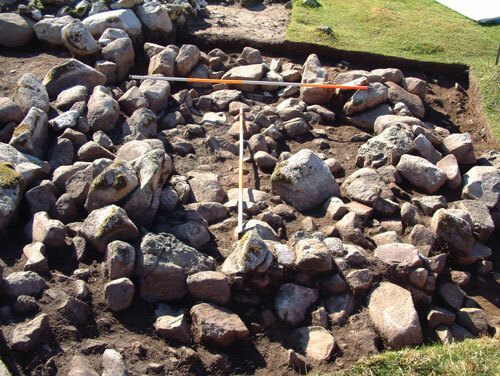 The only small find to be recovered from shieling 2 so far is a fragment of rotary quern stone , that had been built into the core of the wall. 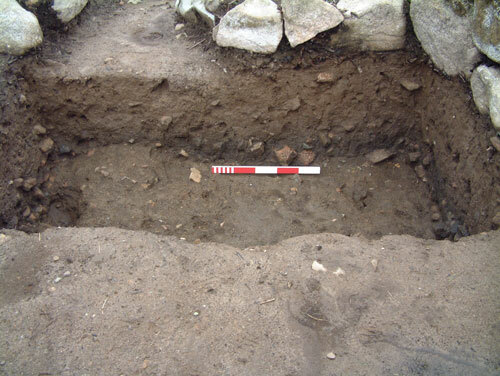 As a part of the fieldwork to investigate the extent of the burnt spreads and to see if any earlier structures exist below shieling number 1, a 2m x 1m test trench was excavated down to the natural ground surface below. Surprisingly, this work revealed quite a deep sequence of archgaeological deposits around 0.7 metres deep, including layers of fire-cracked stone and pebbles. The image below shows the trench during excavation, with the dark charcoal-rich layer containing the burnt stone lying below the sterile slope-wash material. Several sherds of fairly coarse prehistoric pottery was recovered from this dark layer, along with a vitrified fragment of ceramic crucible complete with copper-alloy residues. Small fragments of heavily burnt bone was also found along with a few degraded animal teeth. 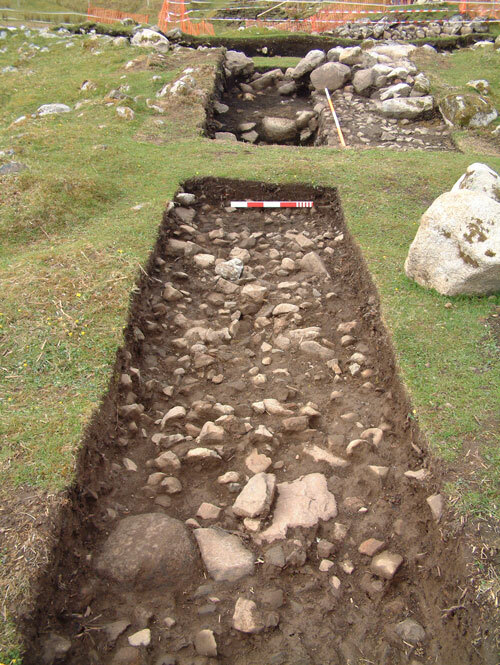 The image above shows the test trench after completion from the E. Note the angled tip lines within the burnt spread material indicated by the alignment of individual stones. 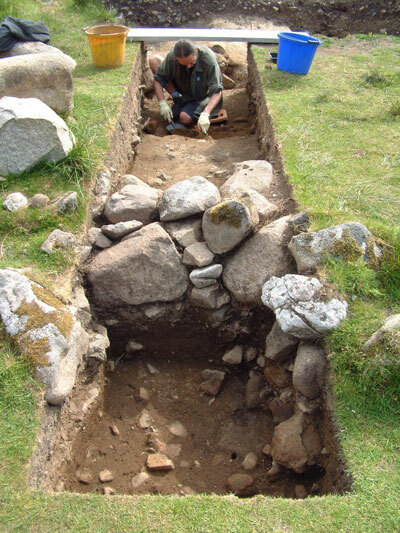 The discovery of the burnt mound/spread material below the shieling structure came as something of a surprise. It appears that the material has filled a natural hollow within the landscape, possibly an abandoned stream channel, while the deposit also appears to be running uphill - a factor that will require further investigation to find the full extent of the deposit in this sector of the site. Already, the burnt mound/spread measures in excess of 40 metres in diameter, indicating that a significant amount of cooking-related activities were taking place at the site. 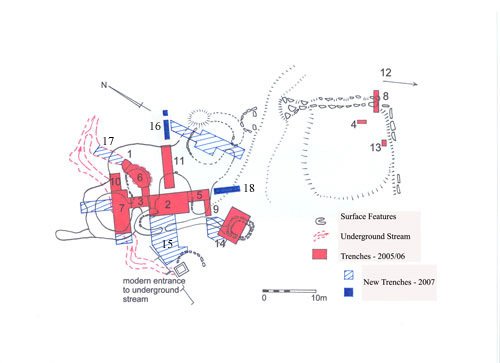 The major trench to be opened at the site this year is number 15, which is located to investigate the forecourt area in front of the original cave entrance into Bone Passage (cave), to the SW of the stairwell entrance. The image above shows Trench 15 from the N. We have already exposed a rough rubble-built wall in this trench and areas of fire-cracked stone. There have been few finds from the trench so far, with just a few pieces of worked flint coming from the topsoil. Once again, this material appears to be of a potentially early date - possibly of Late Mesolithic age. The trench will most likely be excavated over a period of two years, due to the potential complexity of the archaeology and the considerable amount of material that will have to be removed by hand. Where the trench meets Trench 2, over 3.5 metres depth of material will have to be removed! The image above shows the extreme SW end of Trench 15, adjacent to the cavers excavated entrance into High Pasture Cave. 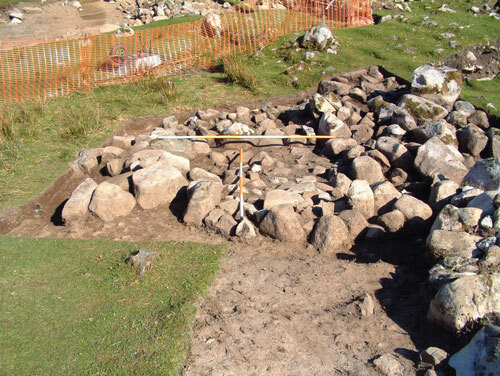 Before excavation, this feature appeared as a low curving wall, arcing around the cave entrance. 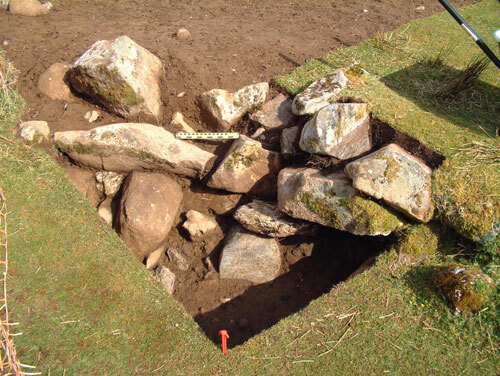 The excavated section through the wall has revealed at least three courses of stonework, which appears to have been built directly on top of fire-cracked stone deposits. The interpretation of this wall is difficult at the moment, although it may be associated with diverting flood overflow water from the cave sink into the blocked cave entrance that was eventually opened up by cavers in 1972 - some form of early flood defense system at the site to stop flood water entering Bone Passage. fascinated and completely intruiged by your discoveries and now this years developments. Your website was introduced to me by my current OU AL tutor, Fiona Mcgibbon.Now following your work with great interest. Today my class and I went to the High Pasture Cave and I was sieving and I found a grinding tool that was made out of pebble stone and George kept it in a safe place. It was about 3000 years old. I felt great when I found it and I had a great day. I want to go back and help out and maybe if someone needs an assistant then I will happily work there.